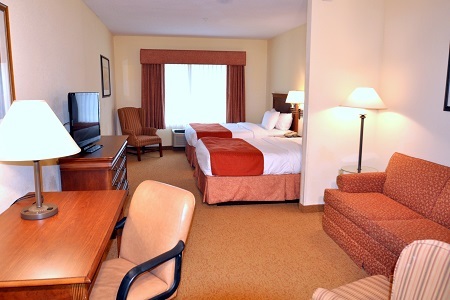 Located off I-87, the Country Inn & Suites® by Radisson, Lake George (Queensbury), NY offers exceptional hotel rooms and easy access to crystalline waters, picturesque mountains and thrilling roller coasters. Here with kids? Walk to The Great Escape & Splashwater Kingdom for thrill rides and live entertainment from May to October. The Lake George area also provides hiking, horseback riding and craft brewery tours all year round. Thanks to our location near the Lake George trolley line, you can even explore some of the area’s top attractions without your car. Start each day with our complimentary, hot breakfast, featuring cereal, yogurt and fresh fruit. For something more filling, try a rotating selection of hot items with options like bacon and eggs. For a great dining spot near the hotel, head to Farmstead Flatbread at Sutton’s Marketplace. Pick from flatbreads, salads and wings made with local ingredients. If you’re craving a heartier meal, visit The Log Jam Restaurant for steak, ribs and seafood. The Great Escape & Splashwater Kingdom – Located within walking distance of the hotel, this amusement park offers more than 40 rides, from exhilarating roller coasters to an old-fashioned carousel. Cool off on the waterslides, or throw your arms in the air on Greezed Lightnin’, Flashback and Steamin’ Demon. The Factory Outlets of Lake George – Only three minutes from the hotel, Factory Outlets features four distinct shopping centers. Enjoy discounts on all your favorite brands, including Polo Ralph Lauren, Levi’s, Banana Republic and Guess. West Mountain – For more than 50 years, West Mountain has offered skiing and snow tubing set against the stunning backdrop of the Adirondacks and the Hudson River. Head about 10 minutes south to find 30 trails on 126 acres of land. 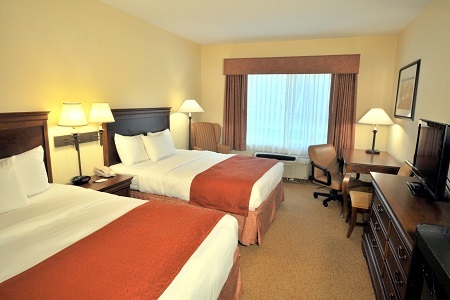 Our 624-square-foot meeting room can comfortably accommodate up to 30 guests for gatherings near Lake George. Enjoy free high-speed Internet access, a 24-hour business center, and complimentary coffee and water service throughout your event. Please note: We now offer two charging stations for our guests with electric cars!